Every Shift / Every Shot! At ES Hockey our philosophy is simple; You have an opportunity to become a more complete player EACH and EVERY time you step on the ice. 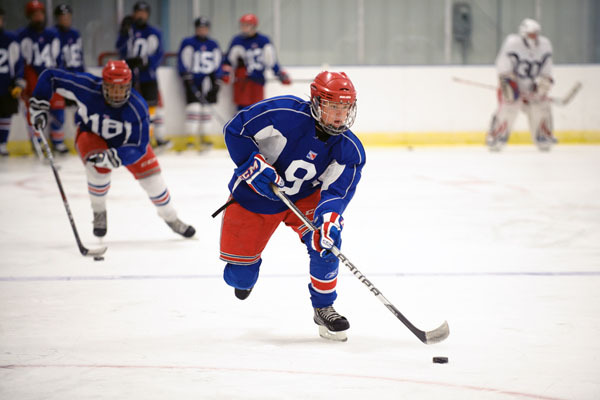 The ES Hockey summer programs take our experience of working with athletes on a ten month basis and provides an intense, comprehensive week-long program that will help you with your upcoming season. We are offering camps from Tyke to Midget aged players, as well as several speciality camps. Each player comes to us with needs and expectations. We assess current ability and offer suggestions that will bring improvement in specific skills and competitive edge whatever the goal – to enhance enjoyment at the recreational level, to make a rep team, or to compete at the AAA level. Our schools offer several types of programs. Some focus on specific skills, some provide pre-season or mid-season preparation, others focus on the refinement of the talents and attitudes needed for competition at the highest level. The ES Hockey School goal has been to provide every player with a safe, challenging and fun experience designed to make them a better player and person. ES Hockey Schools have helped hundreds of players achieve their goal of becoming better players and enjoying the game even more. We help students succeed by providing them with a hockey school experience that is structured, varied and fun in a safe environment. ES Hockey Schools focuses on all fundamentals of the game including skating, puckhandling, passing and shooting with both group instruction as well as significant individual instruction. Each day is packed full of activities that provides every student with a memorable learning experience. Conducting training camps to prepare all age groups for spring tryouts, designed specifically for a certain age group, focusing on the skills required to have a successful tryout. Covering specific skills for the position of defense- efficient first pass, pivots/transitions, gap control, body positioning, active stick, angling, puck protection, offensive point shots. The half day camp has 3 hours of on-ice instruction daily focused on developing all skills of the game, power skating, puck skills, game tactics, goalie training, team play. We have taken our years of summer training experience and created a dynamic, results based program that focuses on preparing you to be your best. We believe that winning your races, winning your battles, and being in top physical condition are keys for you to be a successful player. * All players and goalies will receive an ES Hockey jersey. To register for a camp, please fill out an online registration form - Register Now. Payment details are located on the website as well. PLEASE NOTE: Registration is completed once we have received online form and non-refundable 50% deposit or full payment. If you have any questions, feel free to contact Jamie Israel, jisrael@es-hockey.ca , or 226-220-5882. ES Hockey Training Inc. will be conducting a Summer Defense Camp during the week of August 6-9 at Sportsworld Arena. The 4 day camp is specifically designed for defensemen in the age groups of 2005, 2006, 2007, 2008. The players will cover specific skills for the position of defense- efficient first pass, pivots/transitions, gap control, body positioning, active stick, angling, puck protection, offensive point shots. To register, please fill out the online registration form and select payment option. If you have any questions, feel free to contact Jamie Israel, jisrael@es-hockey.ca or 226-220-5882. The half day camp has 3 hours of on-ice instruction daily focused on developing all skills of the game, power skating, puck skills, game tactics, goalie training, and team play. By using unique training methods, and a wide variety of game situation drills, ES Hockey improves every player’s overall skill and confidence level in a motivated, fun environment. This camp provides the same hours of on-ice development as our full day camp while allowing flexibility for the participant to schedule other summer activities. Registration and Payment To register, please fill out the online registration form and select payment option. If you have any questions, feel free to contact Jamie Israel, jisrael@es-hockey.ca or 226-220-5882. We have taken our years of summer training experience and created a dynamic, results based program that focuses on preparing you to be your best. We believe that winning your races, winning your battles, and being in top physical condition are keys for you to be a successful player. Each player comes to us with needs and expectations. We assess current ability and offer suggestions that will bring improvement in specific skills and competitive edge whatever the goal – to enhance enjoyment at the recreational level, to make a rep team, or to compete at the AAA level. Our staff of professional instructors is unparalleled in instruction and experience. We select only those instructors with a passion for the game and for teaching, while maintaining the highest standards as role models for our younger players. Our goals are to take advantage of our playing and coaching experience and to pass on our lessons in hockey and life to our students. Copyright 2010-2019. ES Hockey Training Inc. All Rights Reserved. Please contact us and we will be happy to answer any questions you might have about ES Hockey Training, or our programs. We take our customer care very seriously. While our aim is to make our website easy to understand and navigate we know there are times when you may need a bit of assistance.